South Gate01553 763044work Historic SiteNot only used as a defensive role, but also acted as a point of entry and exit that could be controlled, which made it easier to collect tolls and duties on merchandise. This large and impressive gateway was seen as a significant display of civic pride. The road leading out of the Gate crossed the fosse and ran beside the river bank, until after 4 miles crossing the River Nar at Setchey Bridge, before branching out to Wisbech and Downham Market. The road leading into King's Lynn is now London Road, but the route used to lay closer to the River Great Ouse and followed along South Gate and Friars Street, passing All Saint's Church, to the Ladybridge and the First Medieval Town. 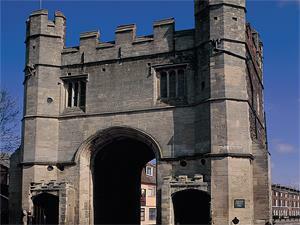 It was built in the 15th Century probably on the regional foundations of the gateway in the reign of Edward III. The structure is built of brick, with stone surrounds to the apertures, and ashlar or thin slabs of hewn stone on the front face. In the 19th Century, on either side of the main entry, the pedestrain passageways were driven through. However, in 1899 the London Road was widened to help improve the traffic flow, and so now to the present day the Gate only straddles half the road. In 1982, at a cost of £80,000, restoration of the South Gate was carried out. The structure is unique and its importance is reflected in its status as a Scheduled Ancient monument/Grade 1 listed building. Not only used as a defensive role, but also acted as a point of entry and exit that could be controlled, which made it easier to collect tolls and duties on merchandise. This large and impressive gateway was seen as a significant display of civic pride. Both Red Mount Chapel and South Gate are open May to Mid-September on Wednesdays, Saturdays and Sundays from 1.00pm - 4.00pm. For all open days please phone 01553 763044 in advance to check details.